The NaHai black metal stand is designed for Samsung Gear S3 watch and smart phones. Made from high-performance aluminum alloy. Place your Gear S3 watch and smart phones to charge them easily and securely. Black metal stand perfectly works with your Samsung Gear S3 watch and smart phones. Come with a tool for easily installing the stand. Please read the installation guide before installaion. 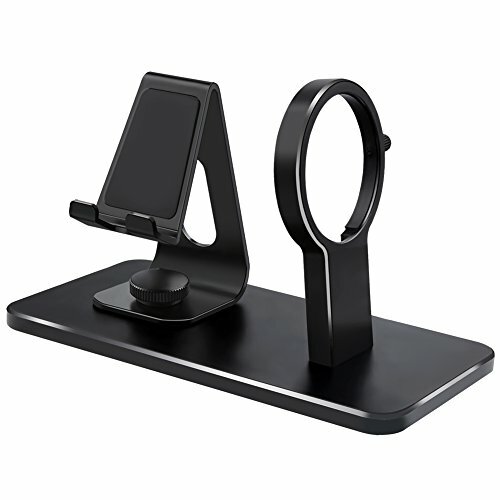 Easy access for charging, this dock will play a good role in your office, kitchen, nightstand and dining table. A great place to keep your Samsung Gear S3 watch and smart phones clean and safe at night while charging. NOTE: Metal Stand ONLY, NOT INCLUDING Samsung Gear S3 Charger, Samsung Gear S3 Watch and Cell Phone. If you have any questions about this product by NAHAI, contact us by completing and submitting the form below. If you are looking for a specif part number, please include it with your message.